The busier someone is, the more they appreciate the small breaks in their daily schedule. Kids barely do anything, so they take their free time for granted, but for the working adult, lunch breaks and time off are sacred. Over the years, we’ve developed perfect break-sized treats to make our day more enjoyable, and every person has their preference. For me (and my friends, as of late), tea is the number one drink, and I try to free up time every day to enjoy it in peace. It’s a little ritual I perform that helps keep my spirits high and my stress levels low. However, after an exhausting work day or if you’re really impatient, making tea is probably not at the top of your list of home activities. Luckily, there are appliances that fix this issue. I like having things in my home be automated, as it feels like the house comes to life when I turn on several machines in the morning. Not to mention the convenience helps me give my guests more attention when they come over. The Nitty Gritty – What Goes Into A Good Tea Maker? Tea makers go through the simple procedure of straining leaves in water. The main benefit here is that you can switch from using cheap, poor quality tea bags and avoid having to purchase the really pricey ones. Nothing is as healthy as homegrown herbs, and tea makers bring out the best in your plants. I got sweet-talked into trying manual strainers during my adventure, and I have to warn you: while they’re cheap, they come with big inconveniences. The parts will often get hot after being used, and cleaning the whole device is more of a chore than manually making tea would otherwise be. Not to mention that the human hand grinds much less evenly than a properly crafted machine would, so you get tiny flakes and leaf clumps in your tea that can put off some of your guests! I take pride in my performance as a host, so I can’t have that, now, can I? They tend to have a big capacity so you can easily prepare multiple servings, and the leaves stay fresh for a good while. Some of them can also be timed to prepare tea even when you’re not at home, so my niece, for example, loves to time her tea for when she comes home from work. There’s a lot of convenience in a good tea maker, and your spare time should be as relaxed as you can make it, so they’re a worthwhile investment, especially if you’re a long-time tea lover. When I went out to find the perfect model for me, I came across several types of tea makers, and I was honestly pretty confused. I didn’t know what all these specs meant and where to start. I now know what you should be looking for, and I don’t want you to go through the same trouble I did. The first tea makers came in this form, and it’s not difficult to see why. These models are easily affordable and don’t require too much work to stay in good shape. Since they’re made of plastic, they’re not super durable, but their big capacity and overall ease of use make them a good pick if you’re not looking to overwork your machine. I considered just getting one of these to skip the hassle of figuring out how my machine works, but I wanted to have a tea maker that is durable enough to give to my grandkids one day, and I wasn’t sure these would cut it. My options also included these machines. They’re considerably more expensive (I couldn’t fit some of them into my budget), but they’re usually more durable (as they’re made of stainless steel and other tough materials) and come with convenient features to further simplify your daily routine. If you’re like me and you pick your tea flavors carefully, these models provide a very important upgrade from the cheaper stuff. Since most herbs require somewhat specific brewing conditions, you can pre-program these machines in ways that match your chosen flavor. That way, you don’t have to manually fix things whenever you make a cupful, removing a lot of the hassle. Other features can include safety mechanisms that automatically turn the tea maker off after a certain period or ones that prevent the tea from getting bitter over time. I’ve already mentioned the most convenient extra gimmick, and that’s the ability to set timers on your tea maker, so a lovely cup is waiting for you right as you’re coming home from work or waking up in the morning. This is a strange little niche category, and while I haven’t tried many of them myself, I’ve heard stories of how useful they can be. The premise is simple – you can carry these models with you and have tea available while you’re not at home. They can keep your tea warm for extended periods of time, which is a pretty big selling point. Cold tea is only good when it’s specifically made for that temperature! If you frequently arrange picnics or spend time at your mom’s place (if you don’t do this frequently, go pay her a visit, she’d love it), look into these. When I learned about the above categories, I was still confused. Sure, there are more basic or more advanced models and all that, but what are the qualities relevant to me? I didn’t know the exact materials used for most of these, and I wasn’t sure what else to look for. Let’s make sure you don’t encounter the same problem! The most obvious quality you want to consider. Simply put, the tougher the materials are, the better. There is no need for any part of your machine to be super flexible or anything like that, so you want stuff that lasts. Be sure to check the quality of the plastic if you go with that kind of tea maker. Look at the warranty you’re being given. How long is it? If your model is made of plastic, and the warranty is short, it may not be a good idea. There is no better way to have your machine refunded than making it obnoxious and complicated to use. No one wants to spend hours figuring out how your device works, so including a handy manual and making things intuitive and simple is the way to go. I passed on quite a few tea makers that looked like a chore to figure out, simply because I don’t save a lot of effort if I have to spend more time learning to use the machine than I would spend preparing the tea manually for a month. I don’t know about you, but I’m a sucker for neat little extra touches on my kitchen gear. If it can do something its competitors cannot, I’m drawn to it, at least initially. These features include safety measures like auto-shutdown, timers, advanced settings that let you fine-tune the brewing process, and similar things. The more features a tea maker has, the more I get the impression that things were thought out and that the appliance has a real place in my kitchen. A high number of features also makes the tea maker cost-effective, unless the price is sky-high. These are the main features I started looking for after a while. At that point, my niece joined in, as her coffee-﻿﻿and﻿﻿-tea machine had broken down a few weeks prior. She shared a few stories about drip tray sensors and maintenance (apparently, lower-quality machines have fragile sensors that can destabilize after a while and report that your tray needs dripping even when it doesn’t), and we went out on a hunt. I was surprised at how quickly she shut down a few salesmen right after they had begun their spiel. She is far less trusting than I am, and I think that’s probably because she has more experience with these machines. This one is quite interesting. It’s got a solid capacity of around 16 oz, and it looks like a scientific device. By that I mean, it’s almost completely transparent, so you can admire the brewing process like you’re watching a lava lamp. It’s pretty mesmerizing, honestly. 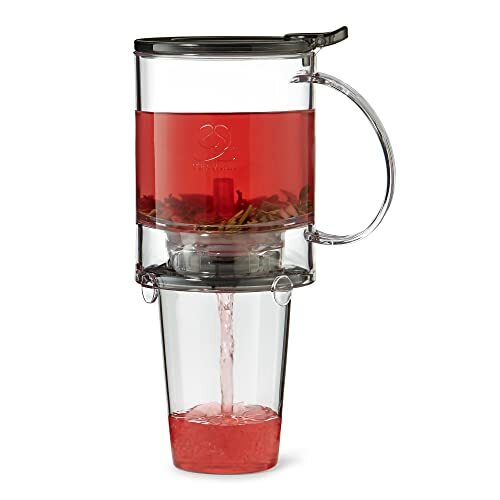 A fun extra thing is that after the tea maker is done, you can simply place it on top of your cup and it drains the tea into the cup without letting the leaves sneak in. It’s a helpful extra feature especially if you (or your close friends) have kids who tend to spill some tea while pouring it. The price isn’t too steep, so it’s a good budget pick. The downsides are minor and tied to the plastic construction. Obviously, this tea maker is not as sturdy as more metal-heavy ones, and it manifests in the form of a small drip at the base of the machine. The plastic also gets stained, and the handle gets hot while you’re using this model. It’s a bit frustrating, but nothing too serious. If you’re being boiled alive by the summer sun, a drink like fresh, hot tea is probably not very high on your list of priorities. Iced tea is growing more and more popular by the day, and the taste should be enough to make you consider converting. Mr. Coffee boasts a 3-quart capacity and its sizeable pitcher is fully dishwasher-safe. You know how cleaning a blender can be really annoying? This tea maker gives no such trouble, so your precious time will not be wasted. 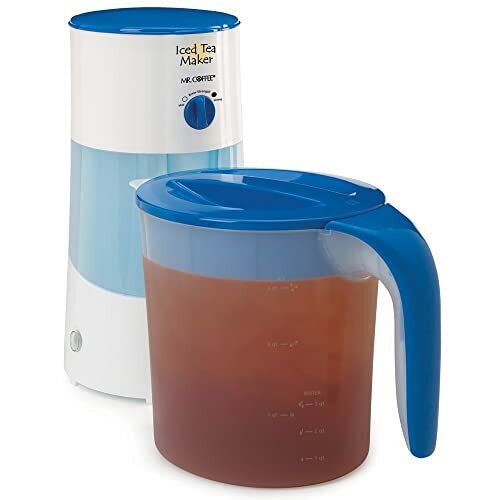 If you lack experience making iced tea (don’t worry, most of us do), you’ll be pleased to know that Mr. Coffee comes with a convenient marker that shows how much ice is being used, so you can reliably make delicious tea without too much trial and error. Extra features include a handy auto shutdown mechanism that ensures your kitchen is safe even if you’re distracted and forgetful. The only real downside is that you don’t get a massive amount of tea for how much herbal mix you put in. So you will probably spend a tiny bit more on the leaves/bags than you would with the other models shown here. For the quality, I’d say that’s well worth it! This tea maker represents the portable category I mentioned above. 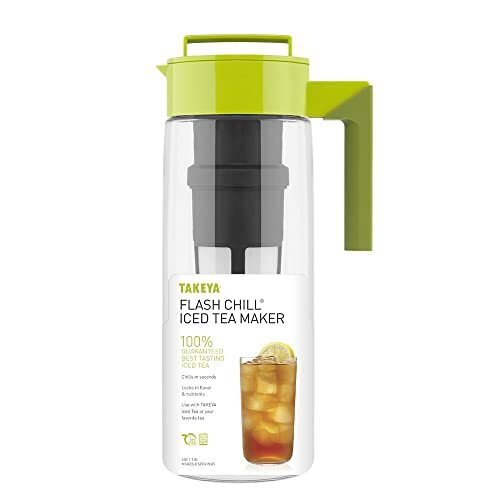 It’s a really convenient little thing for fans of iced tea. While the capacity isn’t up to par with models like Mr. Coffee, the 8 or so servings are more than enough for the workplace or a short picnic. I like keeping my countertops clean and free of any clutter, so the fact that this tea maker fits in the fridge was a really pleasant surprise. The lid is fully airtight, which helped keep a portion I prepared in the afternoon feel equally fresh 4 hours later. It works much faster than the previous iced tea machine, and its design is eco-friendly (if a bit rough). Since it’s smaller and less demanding, it’s also inexpensive, so if you’re not the type to host big parties frequently, don’t hesitate with this one. At least, that’s what I would say if it weren’t for one significant downside. If you prefer tea bags to their loose leaf counterpart, you will be disappointed to know that this model doesn’t work with tea bags. It’s a shame, but the Takeya offers so much in such a small package, I’d say it’s worth the asking price. Works fast, almost to the point where guests don’t notice you preparing a second serving! You didn’t expect our small expedition into iced tea territory, did you? Well, now we’re heading back towards Hot Tea Town, with a fairly pricey but powerful machine. It comes with all the fun features you’d expect for that price range, such as having timers set for up to 24 hours in advance, or an automated basket that moves up and down, helping to squeeze more of that good stuff out of the leaves. It feels like you have a personal robotic butler making top-quality tea for you. The tea can also be kept warm for up to an hour, so if your bus home is late, you don’t have to drink cold tea! You can adjust the temperature to fit the kind of tea you want to make, so nothing is left to circumstance or chance. That kind of reliability doesn’t come cheap, but it also doesn’t come with all models, so you get what you pay for. Pretty fair, if you ask me. Sadly, like the portable Takeya, this tea maker also doesn’t accept tea bags. It’s a bit surprising given how advanced the model is otherwise, but what can you do. Also, it’s not the easiest to keep clean, which makes sense given all the extra gadgets and parts it comes with. If there was ever a better example of “simple and straightforward”, I haven’t seen it yet. 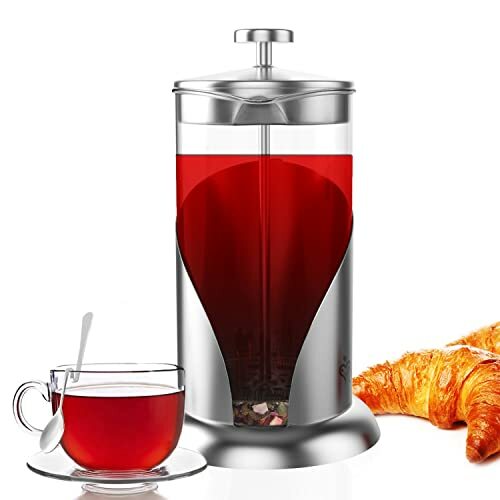 This tea maker works with coffee and does its job well. It has a whopping four filter screens that keep your cup free of coffee grains or little pieces of leaf. The capacity is higher than the other four models, and you can make up to 34 oz of your preferred hot beverage. The convenience (and durability) comes from a double stainless steel lid that not only keeps all the aroma in the cooker but keeps your fingers safe from a searing surprise. As you may have noticed, there aren’t any super-advanced features on display here. I would complain, but this tea maker is so reliable and powerful, it doesn’t need any extras. The one feature I miss is an auto-shutdown safety mechanism, but otherwise, it’s a versatile machine without major issues. The price is a bit steep, but you get a reliable friend in return. All of these are good, don’t get me wrong. But after seeing these and so many others, I knew what I wanted. 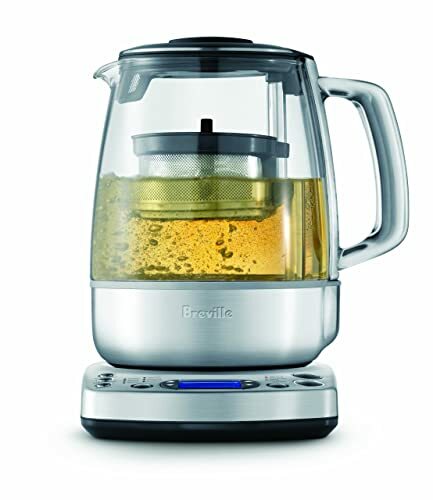 The price bump wasn’t 100% smooth, but I chose the Breville BRM800XL One-Touch Tea Maker. It offers so much, and it fits what I want from a tea maker. I quickly learned to clean it, and it was smooth sailing from there. My niece chose the French Press Coffee & Tea Maker, as she doesn’t like designs she calls “overloaded”.